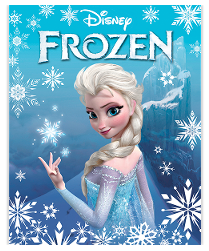 With all the news on the Impressions items, forgot to mention that the Frozen stamp pack went on sale on 10 November. The pack is printed by RA Printing, so the stamps inside should be no different to those in the previous Planes et al. packs. 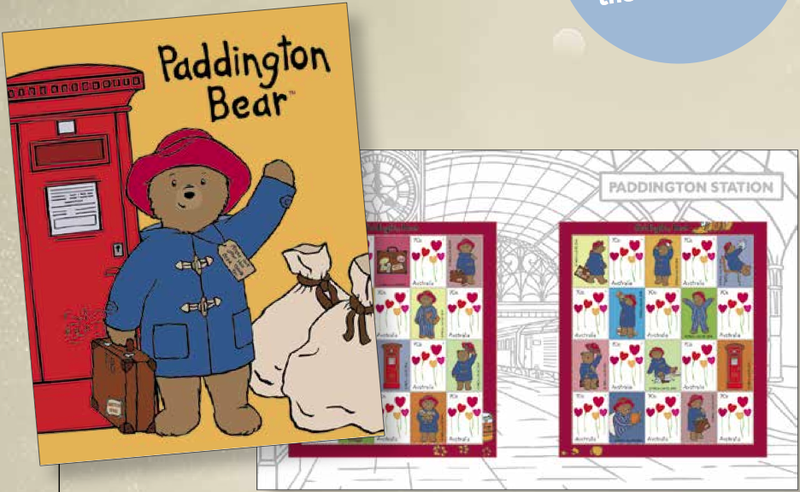 Appearing in post offices from around 5 November, the Paddington Bear pack is the source of two new varieties for Australian collectors - the first time the 70c Love Heart Flowers stamp has been released with a tab; and the first time this stamp has been printed by RA Printing. 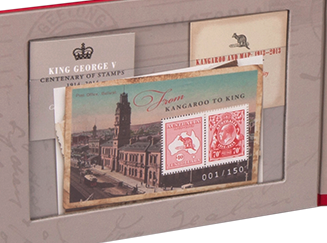 There's one item that many collectors will have missed in this year's Impressions catalogue: The Kangaroo & Map and King George V stamp and coin set. I initially overlooked it thinking it was no different to the individual stamp and coin sets released with the original issues in 2013 and 2014. However, closer examination shows the set includes an exclusive miniature sheet. This set is excellent value for money. Selling for $199, the original stamp and coin sets sold for $89.95 (Kangaroo & Map (limited to 4000, and now sold out)) and $99.95 (limited to 2500). The product went on sale with the vast majority of the other Impressions items on Tuesday. This year's Impressions catalogue should be in the hands of collectors by now. Although some may complain about the products in the range, personally I feel Australia Post should be applauded for the quality of the catalogue and products. This year's images seem to be much more detailed, and appear to be images of the final products (or as close to the final products as possible); much more information is given on each item; and many products appear to much better value for money. A prime example, is this year's commemorative album: WWI Commemorative Album 1914. 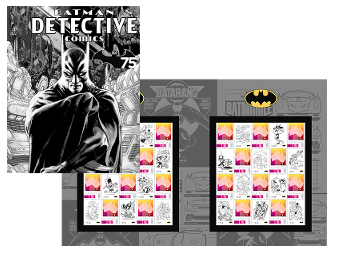 This year's album sells for just $249.95, and contains 11 miniature sheets and a prepaid envelope (all are illustrated in the catalogue), with a total face value $24.70, plus NZ and UK stamps worth approximately $24.50. Each of the six miniature sheet and coin sets (Ulysses Butterfly, Leichhardt's Grasshopper, Corroboree Frog, Orangutan, Asian Elephant and Sumatran Tiger) contain a coin that the Royal Australian Mint sells for $15 (the Butterfly and Grasshopper coins were released this year, and are still available for sale from the Royal Australian Mint, with the others released in 2012 and are now off sale). The Koala, Kangaroo and Kookaburra miniature sheet and gold coin sets each contain a Perth Mint gold coin sold for $59.50. More Impressions Items on Sale, and some off Sale! It seems the list of Impressions items released earlier this week was not complete. Turning up for the first time today (7 November) are the 2014 Multisheets, consisting of four separate sheets - this year we have two portrait sheets, one landscape sheet, and a new one consisting of square shaped stamps. (The Concession Post stamps do not appear in the portrait sheets). The set of four sheets costs $89.95, and as in the past remains one of the best value Impressions items as it contains stamps to the value of $82.70. The WWI Commemorative Album is now off sale (this item has been on and off sale during the entire week). The individual Kangaroo, Koala and Kookaburra mini sheets and gold coins packs are now all on sale, but the set of three is off sale! The image of the Pinwheel pack has been modified - the write up refers to four miniature sheets, but the image has only three - a copy of the pack front has conveniently been placed where the fourth sheet would be. Finally, the imperforate sheets are now 'off sale' (they have been listed as 'out of stock', but I suspect they were placed on sale by mistake). Unusually, the imperforate sheet is available online this year, rather than having to phone in at a set time. Collectors may remember that last year, the imperforate sheet was also available online, but only after the usual phone in. Australia Post has started to sell its annual Impressions items to collectors via their online shop. * The set of three sheets and gold coins are available though from 5 November for $240. I will list issue dates of the above items as they come on sale. 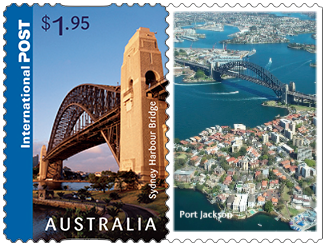 Thanks to those who have had time to examine the recent $1.95 Sydney Harbour Bridge reprint (issued on 1 October), and noticed a difference between the printings. On the reprint the value is in black, whereas the original self-adhesive stamps have a purple value. This difference should result in a separate catalogue number for this reprint. I have stocks of all the self-adhesive stamps released on 1 October for sale. Please contact me at stamps@chrisdehaer.com.au for more information. 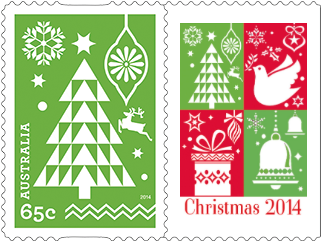 In recent years Australia Post releases two Personalised Stamp™ sheets for Christmas – a sheet featuring the card rate stamps (often containing two or more designs), and one for the standard letter rate (containing a single design). This year, though we have something different – a sheet containing the two secular card rate stamps (nothing usually there) and a sheet containing the card rate religious stamp. There are no standard letter rate Personalised Stamps™ this year. As per usual I will be producing and selling my own Personalised Stamps™. 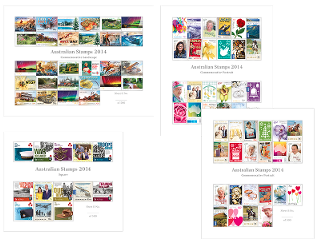 Please email me at stamps@chrisdehaer.com.au for more information. 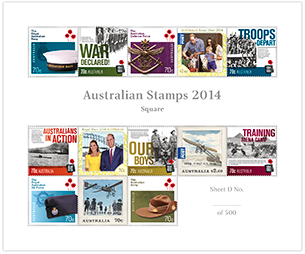 Australia Post mentioned in the latest Stamp Bulletin, that the Impressions™range will be released early November. As in previous year's the usual limited edition products, an imperforate sheet (with a complete new miniature sheet), more coin and stamp products as well as lots of gold stamps. 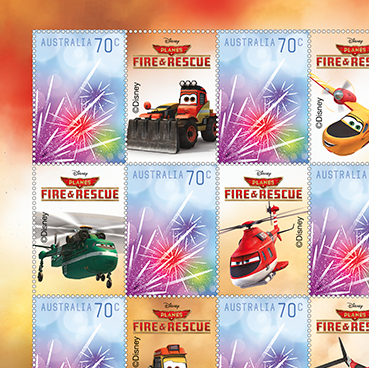 There's been a flurry of stamp packs and sheets released in the past few weeks. There are no official release dates, but the earliest known on sale date is given below. First seen in post offices on 6 October (and in Stamp Bulletin No. 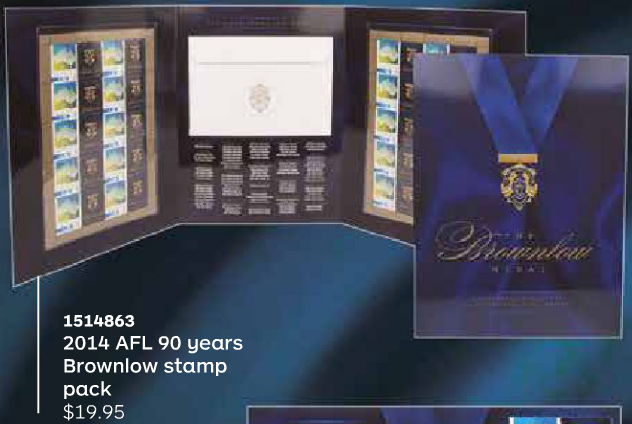 331, but not yet online), this pack contains two sheetlets of 10 blue Australia and Map stamps with tabs in a new layout, as well as a facsimile of the original Brownlow letter. It does not include mention of the 2014 Brownlow winner. Unless the printer of these stamp sheetlets is new, there should be no difference between the stamps in these packs on those in the AFL/NRL Team packs released earlier this year. The pack sells for $19.95. 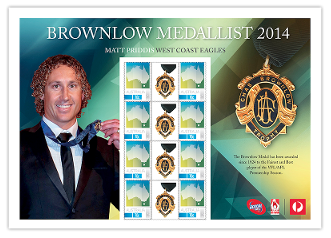 Marking Hawthorn's back-to-back win in the AFL Grand Final and the awarding of the Brownlow to Matt Priddis, these Special Event Sheet features a new layout for such sheets. Featuring eight Map stamps with the tab between the stamps, the two sheets retail for $15.95 each. 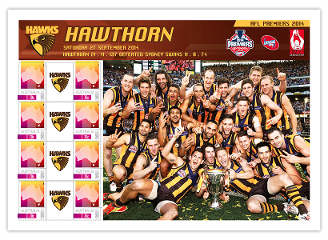 Unless the printer of these stamp sheetlets is new, there should be no difference between the stamps in these packs on those in the AFL/NRL Team packs released earlier this year. 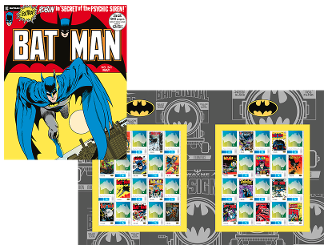 Two packs to mark the 75th anniversary of Batman. Australia Post's product sheets list the release date of these as 22 October, but they first appeared online on 13 October. Unless the printer of these stamp sheetlets is new, there should be no difference between the stamps in these packs on those in the AFL/NRL Team packs released earlier this year. 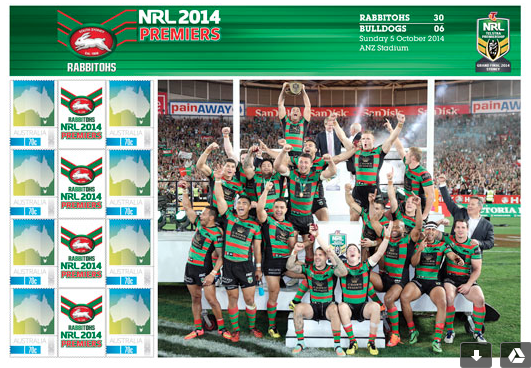 Australia Post will also mark the Rabbitohs Premiership win with a sheet featuring a similar format to the AFL Premiers. Again the sheet will sell for $15.95. 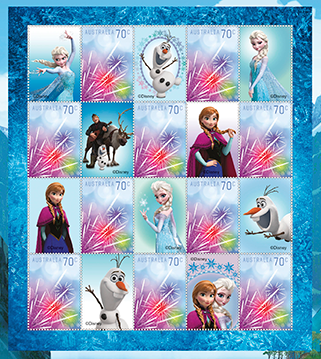 Again it is not expected that the stamps in this sheet will be different to those released previously. I have advised them that the PDF links do not work, and they are working to correct this. PDF versions are finally available, but only in the archives. 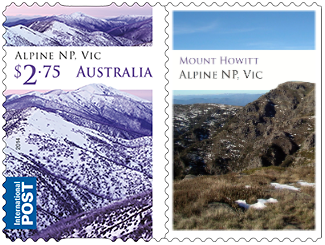 At least one new Personalised Stamp™ was issued on 1 October, featuring the $2.75 Alpine National Park design. As suggested the $1.85 Melbourne Exhibition Centre remains on sale, and the $1.95 Sydney Harbour Bridge design is reissued. As soon as the $1.95 sheets arrive, we will be able to tell if the design is different to the original. 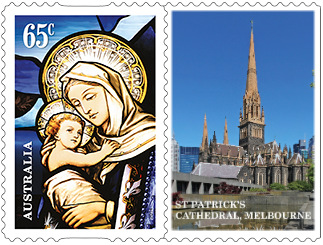 Personalised Stamps™ have arrived from Australia Post. 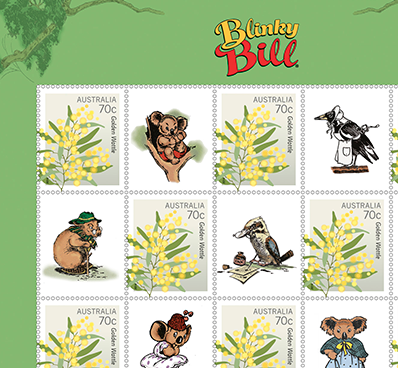 The $1.95 sheets are the original printing, while the $2.75 stamps were delayed and eventually issued on 7 October. In an effort to recoup losses on its letter business, Australia Post is proposing to increase the 60c rate to 70c rate (from 31 March 2014). The proposal needs approval from the Australian Competition and Consumer Commission and the Australian Government. Australia Post will celebrate Australia's 5-0 Ashes victory with two stamps to be issued on 20 January.